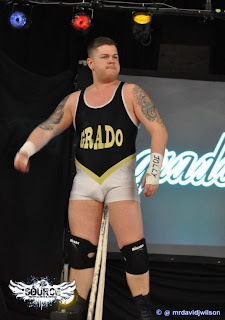 Yes, it's a Scottish Double Header of interviews this week, and after spending time with Scottish Wrestling Ring, it's now time to step back into the ring, as we speak to Fighting Spirit Magazines Most Underated UK Wrestler 2013, it's Grado! Hometown: Glasgow, West Central Lowlands, Scotland. I first got into wrestling in 2002. I trained briefly with Red Lightning, Kid Fite and Drew McIntyre at BCW. I was only 13 at the time so my parents didn't like me travelling alone each weekend and I stopped. I then went back to train a few years later with SWA as they were a lot closer to home, trained by Conscience and Adam Shame. I was never committed, wasn't really good and in hindsight probably got put on shows too early on in my career. I wrestled for a few years, with limited experience and jacked it in when I hit that period of going out at weekends and hanging with pals outside wrestling. It's only in the last 18 months I've got into it seriously, through the popularity of my Youtube videos, my time in ICW and getting regular work with talented guys across the British Wrestling scene, learning on the job! Guys like The Rock and everyone from the Attitude era drew me to wrestling. Waiting every Friday night for RAW on Sky Sports and then Smackdown on the Saturday morning. Then staying up for the PPVs and going into school on the Monday morning bushed with 2 hours sleep, those were the days! 2. What do you consider the next step for British Wrestling, in terms of both growth and recognition? More exposure on the telly. We've been saying the same thing for years but I think we could possibly close to it, something like a weekly national TV slot. There's enough talented wrestlers and characters in Britain to pull off a tidy wee hour to 90 minute show. I'd obviously love to see ICW get back on telly, proper telly with the right channel and funding. The current BWC roundup show is great for British Wrestling just now as well, as fans are getting to know the wrestlers who are doing the local shows and will hopefully entice a fan watching that program to go to a local event. 3. Who has been your favourite person to step into the ring with and why? Can't name just the one but have enjoyed thoroughly wrestling Red Lightning, Noam Dar, Mikey Whiplash, Zack Sabre Jnr, Andy Wild and Mark Haskins. True pros! 1. The Rock v Stone Cold at Mania 17, the culmination of the Attitude era IMO. Excellent build up (the "My Way" video package show before still sends shivers up my spine! ), massive crowd, had everything in it and I was in my element watching it. 2. Just realising I probably dont have a top 3 but other shout outs go to Punk v Cena at MITB, HHH v Taker WM27, HBK v Flair WM24. I also have random matches that I love and always go back to from the 'Tape Trading' era, the Jonny/Jody matches specifically in CZW, Doug Williams v BJ Whitmer in ROH, Joe v Kobashi. I was also a big mark for the deathmatch stuff back in the day and would get more excited for Cage of Death before Mania! 3. Red Lightning v Grado - match where I "won" the ICW title, not the best wrestling match by any means but the crowd in that building that night were off the scale and I'm no joking, old firm football atmosphere. And for the fact I was in it! 5. Where can our readers catch you in action next and how can they get in touch? I have a website that I usually put up my dates when I get round to it, www.gradowrestling.co.uk but I'm mostly talking shite on twitter, @gradowrestling. Cheers!